These are great! I can't wait to see next year's version! 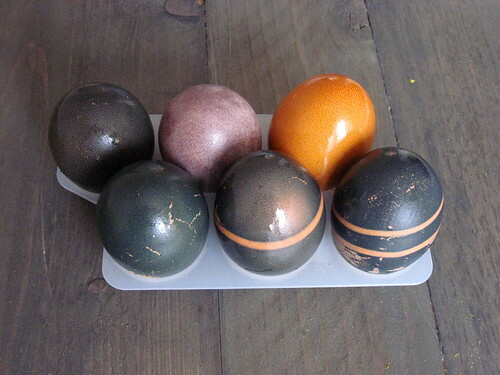 I know I'm a bit late but just wanted to say that another great way of dyeing eggs the natural way is using the dry skins of brown or purple onions. The best result is achieved by soaking the skins and eggs in a pot of water overnight and then boiling them in it the next day. The dye works best on brown eggs, you'll get a darker colour. The dye will not rub off either. You could even put a nice leaf on the egg and tie it all tightly in a nylon stocking so the area where the leaf was will stay pale after boiling. We do it every year and it's all natural!